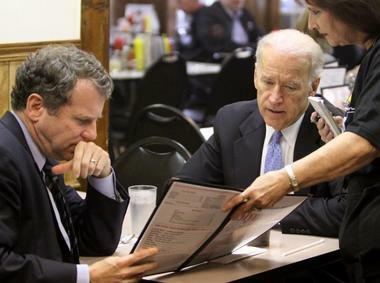 Vice President Joe Biden, Sen. Sherrod Brown paid a morning visit to Slyman's on Tuesday, April 19th, the day we posted about our recent visit there. With this, their celebrity list grows even longer. They also count a visit from President George W. Bush in 2007 (and, of course, your esteemed writers and sandwich eaters). Senator Brown didn't respond to our request for comment on his experience. You can view some WKYC.com video as well.